It is important to remember that you can only make one first impression. Your residency application personal statement is just such a first impression that you must make with an admissions board. It is important to keep in mind that the admissions board members review thousands of residency application CV, so they can get pretty burnt out on reading the same residency application personal statements over and over again. 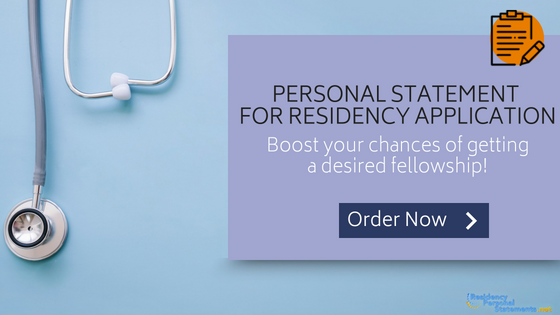 It is crucial to try and stick out among the competition and show them that you have something special that other residency applicants do not have. What Should Your Residency Application Personal Statement Cover? Why are you interested in your specific medical specialty? What training and education have you already undertaken? Why are you going to do well in your area of specialization? What are your short and long term plans for your career? Your personal statement for residency application is just one of potentially hundreds that the committee will have to trawl through to select just a few to interview. You, therefore, need to get their attention and that needs to be achieved right from the start. Good personal statement openers will make the reader sit up and wonder where you are going to take them with your personal statement. Just as a newspaper or magazine article needs to attract attention so must your statement. Describe an experience in your life that has shaped your character and made you passionate about the field of study that you are applying to. Describe how your life accomplishments and achievements distinguish you from other applicants. Describe your personal characteristics that would enhance the program of study you are applying to and how this will help shape your professional career by attending the program in question. Describe what is special, unique, and original about yourself or your life story to the admissions board. Remember to stay somewhat broad in explaining your experiences, but remain acute in explaining particular stories that are more relevant to your professional and academic career. For example, you may choose to write about a certain encounter that was specific to your race or ethnic heritage that has shaped how you view the world and has put a passionate interest in your heart to achieve greatness in your field of interest. Describing your personal background and how it has shaped you. Describing a patient encounter and how it developed your interest. How you were shaped by past adversity. How a mentor has influenced your choice of specialty. The following are therefore 5 examples of opening sentences for a personal statement that will get the attention of the committee. Get the opening hook of your residency application personal statement perfect with the help and support of our professional services.